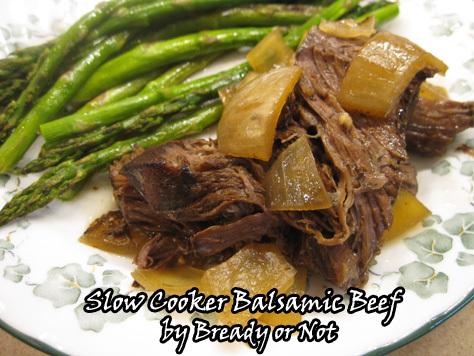 A savory and slightly sweet way to slow-cook as beef roast all day long! Serve by itself, on sandwiches, in salads–it’s delicious no matter how you eat it. In the slow cooker, whisk together the ingredients from the beef broth through the end. Cut the onion into chunks and place in slow cooker. Trim any excess fat from the roast and place the meat atop the onion. Cover and cook on LOW for 8 to 10 hours. Soon before mealtime, pull the meat out and shred apart. Place back in pot to soak up juice. Set the cooker on WARM until ready to serve.